Over the last three weeks, for some 10 children of Deepam West Mambalam, it has been an experience as interesting as it was inspiring. The children were treated to a visit to a Library so near their school that it’s almost like an extension to their class-room. A few weeks ago, one of our volunteers came to know of a small library in an apartment next to the school where Deepam WM functions. This library – called Sri Chakra Library — is run by Karthik, a young guy who holds Master’s degree in English and History and an M.Phil degree too. He is differently abled,having restricted mobility. The volunteers of WM centre got to meet him in April and were impressed with his lively chat. It was planned to take Deepam WM kids in batches to the Library to get them inspired and to make Karthik happier (he is ever happy with a cheerful smile on his face all the time). We then spoke to the school HM, obtained her permission and left word with Karthik’s mom about our plan to bring few children to the Library on a Saturday. She and her son were only too glad to say ‘Yes’. All the books in Karthik’s collection have been accumulated by him over the past many years and maintained with loving care. These books are stacked in a neat way. There are books to take you down memory lane, books that you had always wanted to read but never got round to it, books that today’s youngsters would like to read and – this is where Deepam WM and its children come in — loads of books and magazines (in English and Tamil) specially meant for school-going children. Here’s what Maduravalli ma’am of WM Centerhas to say on how she sold the idea to the children she was sitting with on 6th April and her own experience at the Library. “This morning, when I was sitting with the six girls of V standard, I announced that if they give correct answers for all the revision exercises planned, then a visit to a library will happen. They got so excited and did unusually well in the revision exercises. Just before the visit, I briefed them about Karthik and asked them to greet him before they start reading the books. 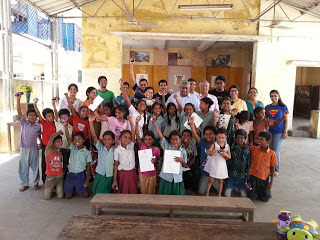 The children were visibly happy to do it when we reached there, what with Karthik’s infectious smile having that magical effect. They scanned through the kids’ books that his mom had kept on the table, and picked one each. 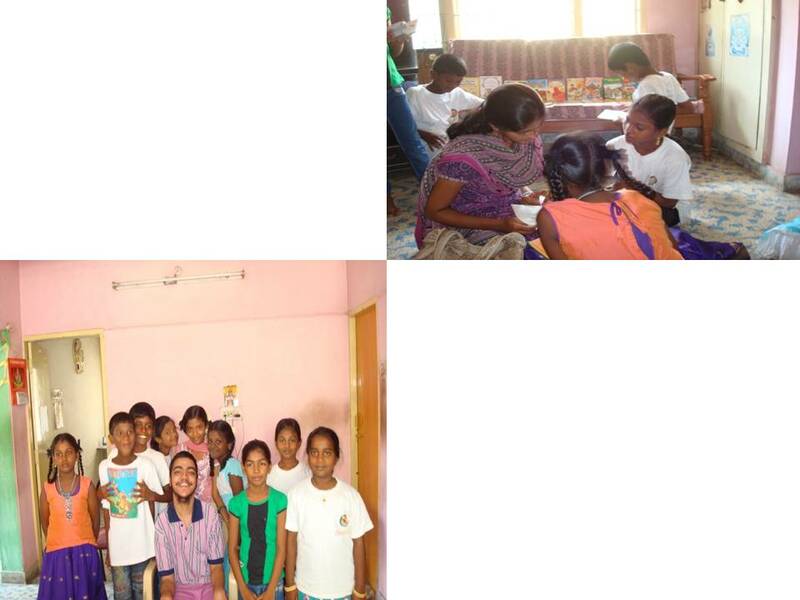 Though most of them were quite high for their usual reading abilities, they did attempt and when I found a very interesting book titled ‘Colour clown comes to town’, I replicated Deepam’s library session there – reading it out to them and the kids enjoyed it so well. “While putting back the books on the table, they noticed that there was a huge Certificate framed and displayed at their sight level. 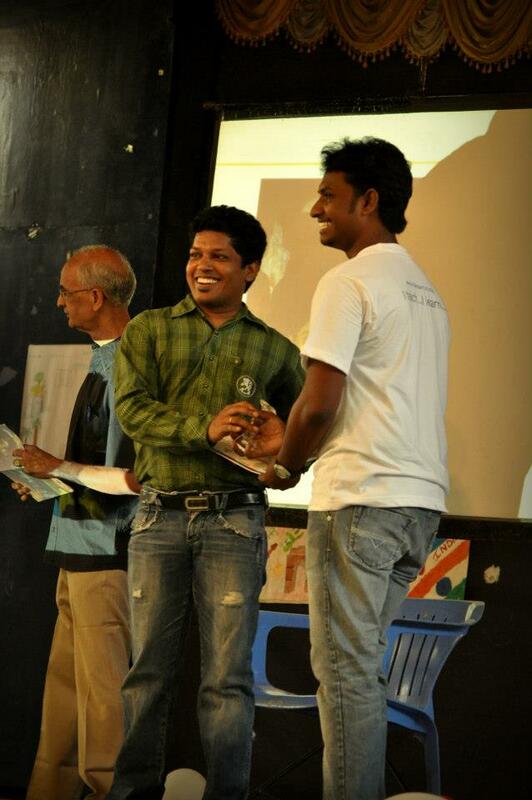 It was the “Young Achiever Award’ given to Karthik by Rotary Club on 26th March this year. It had a short write-up about him and when I read it out to the kids, they came up with an “Aaahh…’ on hearing that he was the school topper in Advanced English and History in his 12th Std Board Examinations. On 13th, another batch of children was taken to this Library and they spent some quality time there for about half-hour, clearly enjoying every single minute of it. And again on 20th, one more visit was arranged, when the children wished to have a photograph taken with Karthik. And the children?As always, when sitting with books, they were quite excited and so it was during every visit. After exchanging greetings with Karthik they would proceed straight to the section allotted for them (a sofa / table on which books are neatly arranged and kept) – where they are sure to find many of their favorite titles. Even long after the visit, their excitement would linger on, eyes alight.Probably with the thought of the story they’d just read or because they’ve found a treasure trove and a friend just next door. Deepam presents the latest edition of its quarterly newsletter encapsulating the events and key landmarks of the first three months of 2013….Check on the link below read more…. Satish from KC center is our “Featured Volunteer for the month” for Feb ’13. At Deepam, all volunteers have been doing and continue to do what they like doing, what comes to them naturally, and they are doing it exceedingly well. They get really rewarded every time they are with children, every time they see a smiling face of a child. Deepam’s Outstanding Volunteer Award is given to volunteers whose performance in the year has made a difference, made people take notice and follow their examples. Deepam takes immense pleasure and enormous pride in acknowledging and sharing with everyone such splendid performance by such volunteers by honoring them with this Award. 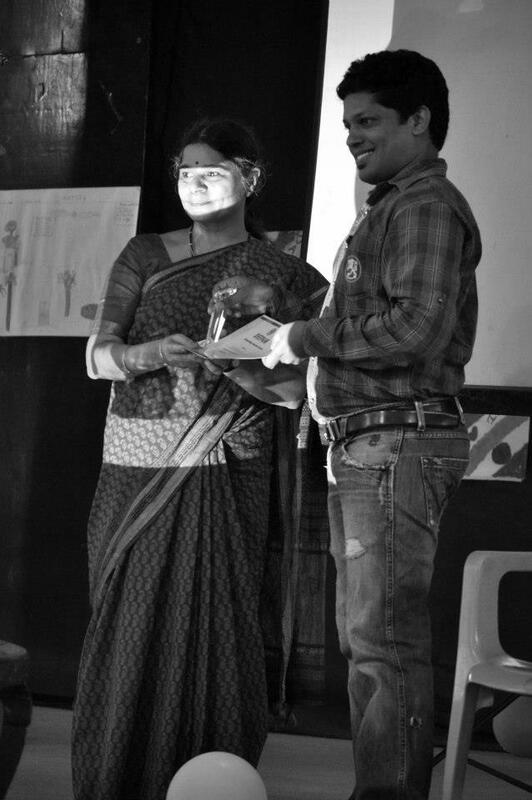 In the past 4 years, as many as 13 volunteers have received this prestigious Award..
A few words about the Recipients of Deepam’s Outstanding Volunteer Award for year 2012. 1. 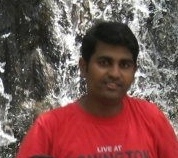 M Sugumaran of Olcott Center – He has infused fresh blood, fresh thoughts and fresh mindset among his team. His mails exude enthusiasm in its every sentence. Dynamic and self-confident, he sets for himself seemingly unrealistic targets and surprises everyone by achieving them! He organized the first-ever Sports event at Olcott Centre. His ever-cheerful manner and how-can-I-help attitude are contagious and these have helped him in increasing regular volunteer strength at Olcott Centre to more than 10. 2. 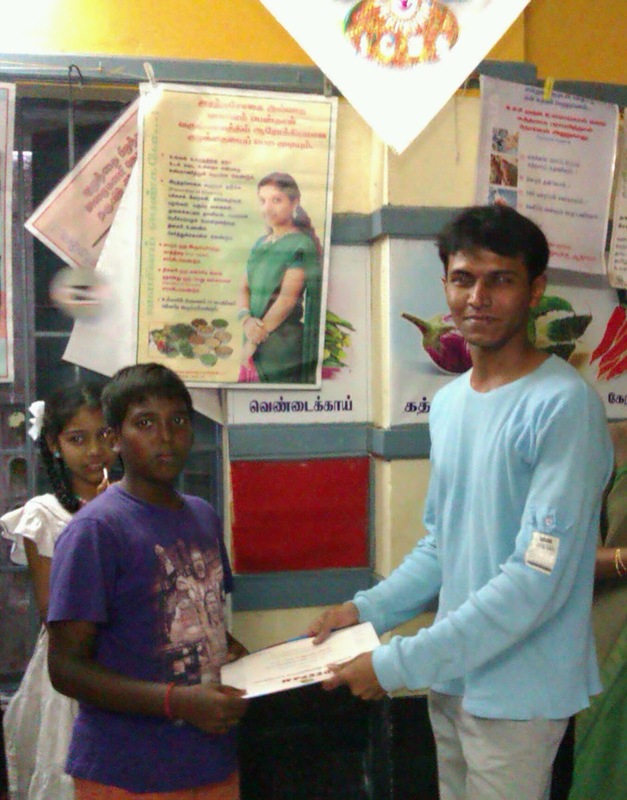 Vedavalli of KC Center – She is a regular volunteer at Deepam for over 3 years now andlikes to keep a low profile. She has been an embodiment of patience and perseverance. To reach her Centre, run at a community hall in Kakkan Colony, she has to overcome many obstacles, some of them she has to literally side-step. Undeterred by these and otherimpediments, shepersisted and has successfully kept the classes going regularly. She has now built a team of over 10 regular volunteers at the Centre. Last year, she initiated scholarship program for the children. Her interest in the children does not stop with teaching them computers or language – her concern for them extends to upliftingtheir conduct, attitude and behavior.